The center of NYU is its Washington Square campus in the heart of Greenwich Village. One of the city's most creative and energetic communities, the Village is a historic neighborhood that has attracted generations of writers, musicians, artists, and intellectuals. 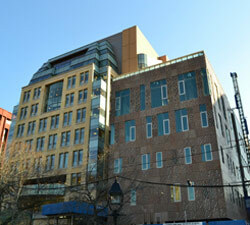 Beyond the Village, New York City becomes an extension of the University's campus. Arts Reach has made arrangements with these hotels for our conference delegates to receive special rates. Each hotel is a short walk or ride from the conference location; pick the one that is closest to where you like to be when you're in New York! Make your hotel reservation as early as possible; space is limited and there are deadlines by which you must make your hotel reservation to qualify for the special rate. After the deadline, availability of the special rate will be at the discretion of the hotel. Below are some links you may find useful while traveling into New York City. The University is located at Washington Square Park on the island and borough of Manhattan in the neighborhood called Greenwich Village. Below are directions for getting to NYU and links to useful maps. From La Guardia, Kennedy, or Newark Airport, take the airport shuttle bus to Port Authority Bus Terminal or Grand Central Station. From Port Authority, take the A or E subway downtown to West Fourth Street-Washington Square Station, or from Grand Central, take the Lexington Avenue subway (No. 6 train) downtown to Astor Place Station. Cabs and car services are available at the airport and, even though they cost more, they are your best bet if you have a lot of luggage. Plan on spending at least $25 to $40 depending on the airport and time of day. Take the NY State Thruway, which becomes the Major Deegan Expressway in the Bronx, to the Triborough Bridge (toll). Cross to Manhattan taking the FDR Drive. Follow the FDR Drive south to Houston Street. Continue west on Houston Street past Broadway to La Guardia Place. Turn right (north) and follow La Guardia Place to Washington Square. Take the Lexington Avenue subway (No. 6 train) downtown to Astor Place Station. Go west on Astor Place to Broadway. Walk south on Broadway to Waverly Place. Walk westward on Waverly Place until you reach Washington Square. Take the 8th avenue subway (A and E trains) downtown to West Fourth Street-Washington Square Station. Walk east on West Fourth Street until you reach Washington Square. To Ninth Street Station (Sixth Avenue and Ninth Street), then walk south to West Fourth Street and east to Washington Square. All Greyhound and New Jersey Transit buses go to the Port Authority Terminal. Port Authority marine terminals in New York and New Jersey are open and operating normally. From there, take the Eighth Avenue subway downtown (see By Subway below). Take the Lexington Avenue subway (No. 6 train) to Astor Place Station. Go west on Astor Place to Broadway. Walk south on Broadway to Waverly Place. Walk westward on Waverly Place until you reach Washington Square. Take the Broadway subway (N, R or W train) to Eighth Street Station. At Broadway walk south to Waverly Place. Walk westward on Waverly Place until you reach Washington Square. * The N runs late at night and weekends. The R does not run late at night. Take the Sixth Avenue subway to West Fourth Street-Washington Square Station (A, C, E, B, D, F, or V train). Walk east on West Fourth Street until you reach Washington Square. * The A and C don't run late at night, the E, F and V run from 6 a.m. to midnight, the B runs weekdays from 6 a.m. to 9:30 p.m., and the D runs at night. Take the Seventh Avenue subway to Christopher Street-Sheridan Square Station (1, 9 or 2). Walk east on Christopher Street to West Fourth Street. Continue east to Washington Square. * The 1 and 9 are rush hour only, and the 2 train runs late at night. Take the New England Thruway (I-95) into the Bronx. Then, take the Bruckner Expressway (I-278) to the Triborough Bridge (toll). Cross to Manhattan taking the FDR Drive south to Houston Street. Continue west on Houston Street past Broadway to La Guardia Place. Turn right (north) and follow La Guardia Place to Washington Square. Take I-95 and/or the New Jersey Turnpike to the Lincoln Tunnel or the Holland Tunnel. If taking the Lincoln tunnel, take the right tube and stay in the right lane, turning right onto Dyer Ave. after exiting the tunnel. Go through three lights, making a left on to 34th St. and move to the right lane. After one block, turn left onto 9th Ave., continuing south until 14th St. Turn left onto 14th St., followed by a right onto 5th Ave., until it ends at Washington Square. If taking the Holland tunnel, there will be a circle after exiting. Take the Canal St. East exit. After a few lights, turn left onto West Broadway. Proceed north until you reach Washington Square. Take the Henry Hudson Parkway (turns into the West Side Highway/12th Avenue) south to 23rd Street. Turn left (east) on 23rd Street to Fifth Avenue. Turn right (south) on Fifth Avenue to Washington Square. Take the Manhattan Bridge. Off the bridge, take Canal Street west to Sixth Avenue (also called Avenue of the Americas). Take Sixth Avenue north to West Fourth Street and travel east to Washington Square. Take the 59th Street Bridge and turn left (south) on Fifth Avenue. Fifth Avenue ends at the Washington Square campus. Take the Staten Island Express across the Verrazano-Narrows Bridge crossing into Brooklyn. Take the Belt Parkway west to the Brooklyn-Queens Expressway (BQE) east. Take the Manhattan Bridge exit, cross over the bridge, and take Canal Street west to Sixth Avenue (also called Avenue of the Americas). Turn right (north) on to Sixth Avenue to West Fourth Street. Turn right (east) and travel to Washington Square. Take the Long Island Expressway (also called the L.I.E. or I-495) west to the Queens-Midtown Tunnel. Drive west on 37th Street to Fifth Avenue. Turn left (south) on Fifth Avenue until it ends at the Washington Square campus. Since 1985, our experience has been drawn from 100s of venues, with 1000s of users who use Theatre Manager softwae to track approximately 3/4 of a billion dollars in annual revenue. Vendini makes the business of live events simple. Offering a full suite of solutions built for the performing arts and live event spaces, Vendini is helping thousands of venues increase revenue, collect valuable data and make running an event simple. In a world of endless single-use vendors, Vendini is the first company to offer one comprehensive solution for multiple aspects of live events including ticketing, marketing, fundraising, logistics and more.